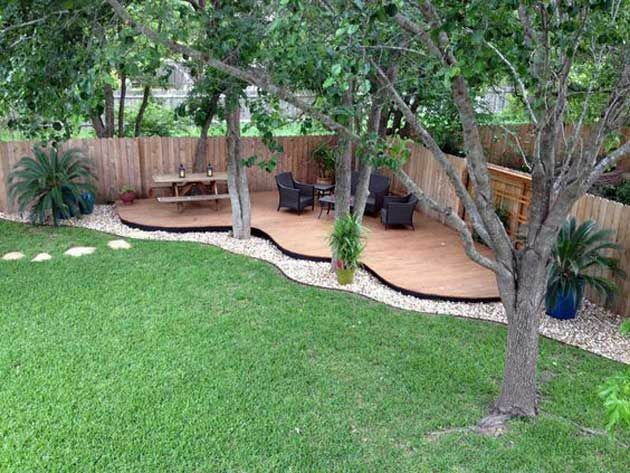 If you’re looking to entertain, then you must have an area in your backyard to do so. This means you need the ideal Olathe outdoor kitchen. A built-in grill and refrigerator is an absolute must. You could also add a large, stone food preparation area and a dining table to top things off. One of the best ways to up the appeal of your backyard in the cooler months is through a fire pit or outdoor fireplace. The allure of a fresh flame will attract everyone on a cold day. Some of these pits can even double as a pizza oven in your outdoor kitchen! Your outdoor entertainment area will always need some shaded spots. That’s why every backyard needs a solid pergola with some furniture. Some prefer to use a pergola for their outdoor kitchen while others set the space up further away from the house. To create a relaxing ambiance, you’ll want to add some water features to the best backyard in Olathe. At Huston, some of our favorite options include pondless waterfalls, koi ponds, and natural creek beds. For many, a water feature signals the next level of backyard perfection and enjoyment in Olathe. Last, but not least – your Olathe landscaping needs to be sharp if you want to entertain in the backyard. Keep the grass freshly cut. Trim the bushes and the trees. Make sure everything looks fresh and well-maintained. Whether you want to maintain your lawn or add a stunning Olathe outdoor kitchen, our expert staff here at Huston Contracting is here to help. Just get in touch today for a free consultation. Let’s talk about how to create the best backyard in Olathe at your home. July is here. The dogs days of summer are in full-force, but they won’t last long. July and August will be gone before you know it. Soon, it’ll be mid-September and you’ll be wondering what you could have done to prepare your lawn for fall. Luckily, that’s where we come in. As the Olathe landscaping experts, Huston Contracting is here to ensure your lawn looks lovely as the weather slowly starts to turn. We know how important it is to keep your landscaping looking good. So, we prepared a few tips. Make no mistake about it: a hot, dry summer can be tough on your lawn. You need to assess the damage done to your Olathe landscape before fall rolls in. See what plants died, assess how your lawn looks, pay attention to any plants that have overgrown, and make a general assessment of your lawn. Many yards need fresh mulch after the hot summer months. You’ll want to add mulch to any spots lacking or where things have dried up a little too much. This is a quick fix that pays a lot of dividends. If you planted a lot of summer annuals, it may be time to replace the old with something new. Head down to a nursery and start searching for cold weather plants that can handle what the fall is about to throw at them. Before fall rolls in is one of the best times to fertilize your lawn. Your grass and plants need adequate nutrition to prepare for the cold weather coming. Fertilizer gives them just that and a lot more. If you have a compost, it’s important to pay a little extra attention at the end of the summer. Make sure no diseased plants made their way into the compost, check to see how the area is doing, and offer a little extra TLC. The end of summer is one of the best times to install a new irrigation system, especially if you may use it during the winter months. You want to install the system when there’s still a little heat in the grass and ground. This ensures a little growth before things get too cold. If you’re truly looking to prepare your landscaping for the fall, get in touch. At Huston Contracting, we can help any and every Olathe landscape when the seasons change. We look forward to working with you.